Gavin McNicholl (Jeff) and Whitney Andrews (Joan) play a married couple in the Redhouse production of 70 Scenes of Halloween. Editors note: This review originally appeared on Green Room Reviews  on Oct. 21. When a play is called “70 Scenes of Halloween,” it seems like there are only two possible options for how the evening will play out. One option, it could be 70 scenes of short Halloween sketches performed in an almost "Saturday Night Live" style. Otherwise, it could be something that tries to scare its audience. This Redhouse production of Jeffrey M. Jones’ play awkwardly falls somewhere in the middle. 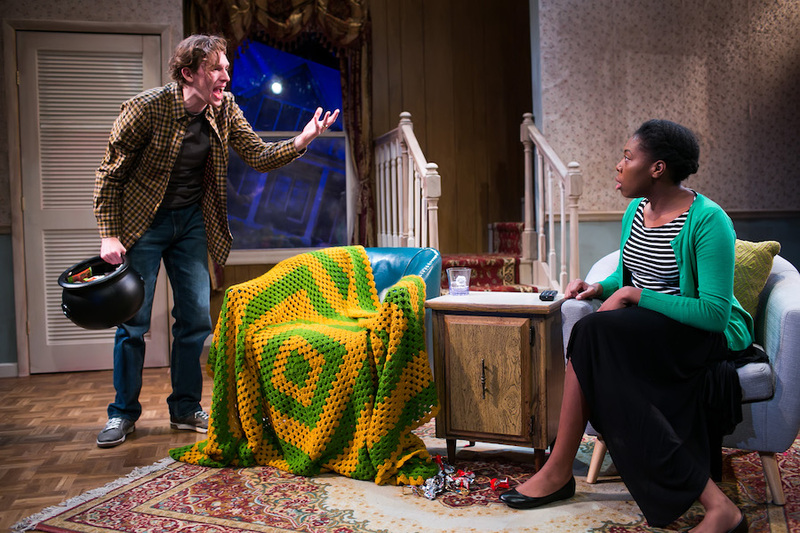 The events of the play surround Jeff (Gavin McNicholl) and Joan (Whitney Andrews), a married couple spending Halloween evening in their house. For as simple as that setup sounds, what follows is incredibly convoluted. It sporadically contains otherworldly alternate versions of Jeff and Joan (played by Stephfond Bruson and Marguerite Mitchell) who occasionally terrorize their counterparts while wearing Werewolf and Witch costumes. The 70 scenes are presented out of order. Scene numbers are spoken aloud and initiated by an offstage voice. In the end, the actual scene numbers don’t matter. The action on stage is its own disjointed entity all together. The comedic aspect of this play shouldn’t be undercut. There are legitimately funny moments. However, they’re so obscured by the bizarre nature of the play as a whole that they’re difficult to appreciate. It’s the same feeling as watching the YouTube classics “Too Many Cooks” or “Don’t Hug Me I’m Scared.” It’s fun and entertaining until it’s not. There’s that ability to slip into a disturbing alternate reality. That feeling is aided by Tim Brown’s set design. Shadows on the wallpapered walls of the living room set mark the places where paintings and pictures have been removed. Dead center are two bucket chairs facing a small television. A chandelier hangs overhead. There’s very little that makes the house feel like a home. The characters feel out of place in their own space. Directly behind them is a window showing another house askew as if built on its edge. The environment sets a promising tone. This tone, however, was not quite matched by the acting. McNicholl offers a spectacular performance as Jeff. In a role that calls for him to access a variety of versions of his character, McNicholl effortlessly morphs from something similar to the crazed Jack Nicholson in “The Shining” to lazy stoner and everything in between. He brings such a tension and passion to the stage that any time he is out of sight, his presence is severely missed. Despite the abilities of McNicholl, the performances as a whole represent a fundamental disconnect between what is being performed and how it’s being received. Chuckles throughout the audience while a man genuinely, emotionally confesses that he’s been cheating on his wife feel out of place. Perhaps it came from being uncomfortable. While this production easily found the comedic moments, it struggled to find the gravitas to make the more serious moments work. The tagline for “70 Scenes of Halloween” is “a comedy to die for.” It certainly achieves the requisite moments of laughter. Looking at the reality, though, this play is an exploration of a man’s inner turmoil as he works through a failing marriage. It’s a puzzle that relies on feeling and audience instinct over complete understanding of the plot. It’s not easily experienced nor easily digested. 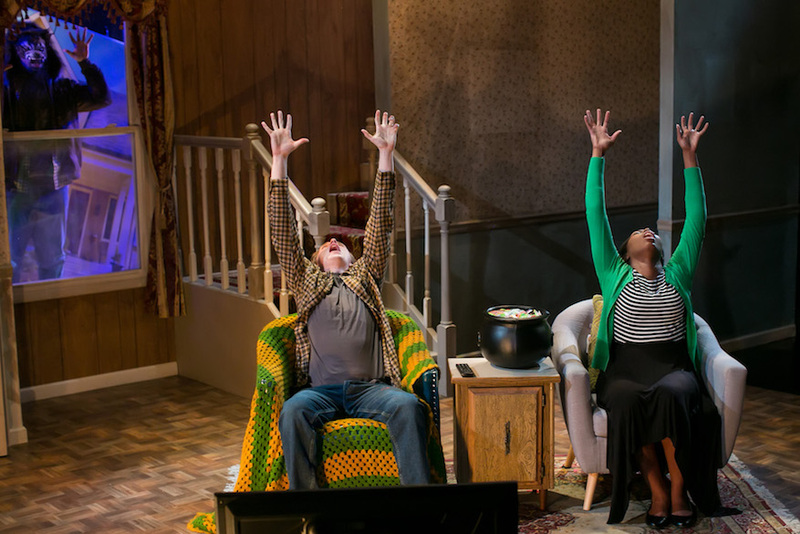 If you're looking for a challenge with a side of laughter, this Redhouse production can be a conversation-worthy night out. Gavin McNicholl (Jeff) and Whitney Andrews (Joan) in the Redhouse Arts Center production of 70 Scenes of Halloween.